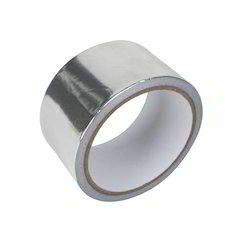 Our product range includes a wide range of water based aluminum foil tape and aluminum foil tape. With the help of our professionals, we are offering our clients Water Based Aluminum Foil Tape. This tape is processed from the finest quality basic material as per the set quality standards. In order to furnish the varied requirements of our esteemed patrons we are engrossed in offering a broad assortment of Aluminum Foil Tape. It is a specialty tape designed for mounting of refrigeration coils and other similar applications.